Investment bank Morgan Stanley have announced a sizeable upgrade to their forecast for the British Pound against the US Dollar which also translates into a stronger Pound against the Euro. News of upgrades to Sterling are significant in that Morgan Stanley have been among the most bearish in the City when it comes to expectations for Sterling; as late as August 2017 analysts were forecasting the Pound-to-Euro rate to fall to 0.98 by March 2018. We have since seen a series of upgrades for Sterling from a number of analyts over recent weeks as the currency outperformed against most of its peers as markets saw diminishing risks posed by Brexit. Morgan Stanley's latest upgrade is however, more than anything, a downgrade for the US Dollar rather than a newfound attraction to the British currency. Indeed, economists believe Brexit risks are likely to remain elevated through the duration of 2018 as EU and UK negotiators are only likely to reach a Brexit trade deal in late 2018. "We think the transition deal will only become binding when a trade deal is agreed, and there is a risk that the trade talks break down, leading to a 'no transition' Brexit in March 2019," says Jacob Nell, an economist with Morgan Stanley. Nevertheless, the downgrades to the US Dollar are notable as they imply a higher GBP/USD which would typically be expected to assist a host of other GBP-pairs higher, including the GBP/EUR. “Global capital demand is likely to rise, given both more expansionary US fiscal policy and increasingly strong global economic performance, which has convinced us to expect the longer-term USD downtrend to start sooner and be more pronounced,” says Hans Redeker, head of Foreign exchange strategy at Morgan Stanley. An upward USD correction - i.e. a recovery in the broader move lower - is however likely at some point and Morgan Stanley had previously anticipated this move for the second half of 2018. It has however "been brought forward into 2Q; we expect it to be more shallow." The Dollar has received a near-constant drubbing as global economic growth picked up in 2017, and is set to rise further still during 2018, drawing yield and return-seeking capital out and away from the US. 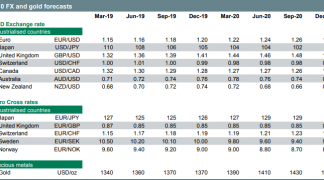 Redeker and the Morgan Stanley team forecast this tighter “liquidity” environment will continue to hammer the Dollar going forward, which is the basis for their forecast changes this week. The US Dollar index, which measures the Dollar against a basket of currencies, has fallen more than 3% in 2018 and is down 11.46% over the last 12 months alone. Morgan Stanley now predict the Pound-to-Dollar rate will rise back to 1.41 before the end of March 2018, a substantial upgrade from Morgan Stanley’s earlier forecast for an exchange rate of 1.25. For year-end, Sterling should trade around the 1.38 level, which is below the current 1.40 level but significantly above Morgan Stanley’s earlier forecast for a Pound-to-Dollar rate of 1.24. On the other hand, relative to the Euro, the Pound is expected to hold its around against its continental rival in the short-term, before carving out new lows as it falls behind the Euro in the race against the Dollar later this year. Sterling is forecast to trade at 1.1280 against the Euro come the end of March. However, the FX strategy team see the Pound succumbing to weakness against the Euro later in 2018, with the exchange rate set to close the year at a paltry 1.0598. This would be the lowest level for Pound-to-Euro since January 2009. 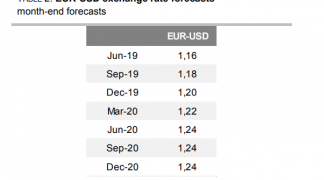 Part of the reason for the GBP/EUR weakness that is seen coming is the strong upgrade to the EUR/USD exchange rate with the bank now predicting the EUR/USD rate will finish the first quarter at 1.25, up from its earlier forecast of 1.20. This is before the exchange rate rises to 1.30 in time for year-end, up from an earlier forecast of 1.17. 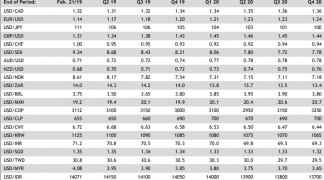 Despite the substantial upgrades to earlier forecasts Monday, and a chequered record of bearish calls on the Pound, there could be some merit in Morgan Stanley’s view of a lower Pound-to-Euro by year-end. After all, previous rounds of Brexit negotiations have all gone down to the wire and the end of October marks the final deadline for a deal to be concluded. If an agreement were not struck by this time, then markets could fret about a disorderly exit from the EU, leaving Sterling under increasing pressure. Morgan Stanley are not alone in their bearish call on the Pound either as analysts at UBS upgraded their Pound-to-Dollar and Euro-to-Dollar forecasts barely two weeks ago. The culmination of these changes was also an implied Pound-to-Euro target of 1.05 by year end and parity for the exchange rate by the end of 2019. However, not everybody is bearish in their outlook for the Pound-to-Euro rate in 2018. Analysts at Danske Bank predict an exchange rate of 1.1627 while Natwest Markets, the investment bank owned by RBS, is looking for a Pound-to-Euro rate of 1.1220. 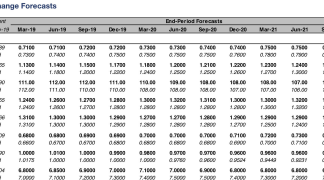 Strategists at Crédit Agricole also put the Pound-to-Euro rate higher by the end of 2018, at 1.1363, after revisiting their EUR/USD and GBP/USD forecasts in February.